We're surprised this was actually for sale! We love you, Topshop, but this is just downright offensive. An angry customer tweeted this picture of a not-so-subtly racist Topshop charm necklace that was on sale in stores. Acceptable because it’s “vintage style” and “not racist?” We beg to differ. 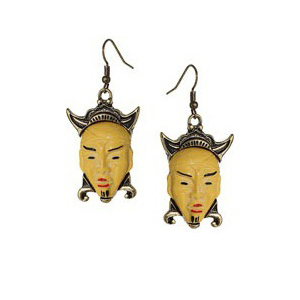 The “Head Charm Necklace” depicts a blatant stereotype of East Asians. 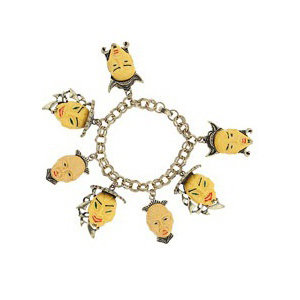 Topshop is calling it “eclectic Chinese mask charms,” but we’re calling bullsh*t. The necklace, which also comes in a matching bracelet and set of earrings, is an undeniable example of yellowface. As Refinery29 points out, the faces on the necklace are very similar to ones from anti-Chinese propaganda cartoons from the 1880s, and the evil Chinese television character known as Fu Manchu. The striking resemblance raises a serious red flag. The necklace has since been removed from Topshop’s website, but we’re still feeling uneasy about the jewelry. These necklace “charms” are definitely reminding us of the equally controversial Dolce & Gabbana earrings that showed up on the fashion runway in 2012. Let’s get one thing straight, people — accessories should offend, they should enlighten. Head over to Refinery29 to read more. What do you think of this Topshop charm necklace?